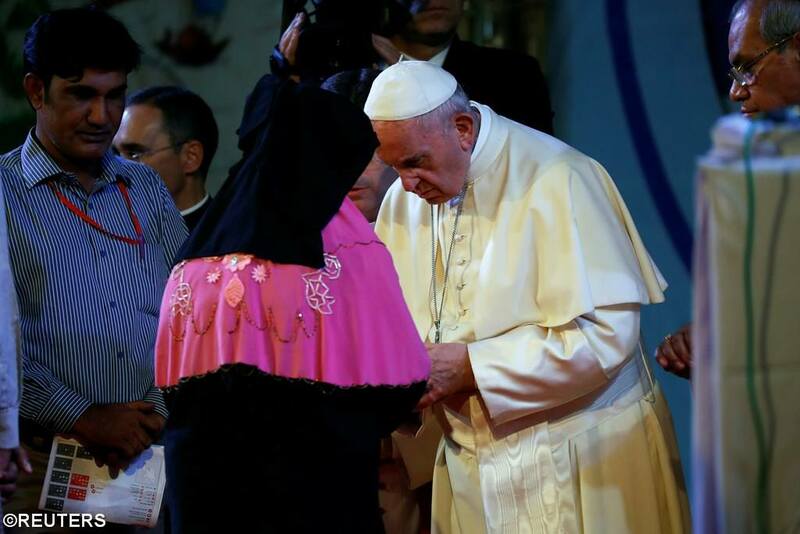 (Vatican Radio) Pope Francis on Friday greeted and blessed a group of Rohingya Muslim refugees who fled to Bangladesh from neighboring Myanmar. The moving meeting took place during an Interreligious and Ecumenical Meeting for Peace in the garden of the Archbishop of Dhaka’s residence. The meeting, which saw the participation of representatives of different faiths, took place on the second day of the Pope’s Apostolic Journey to Bangladesh. The 16 Rohingya - 12 men, two women and two young girls - traveled to Dhaka from Cox's Bazar, the district bordering Myanmar where refugee camps are overflowing with more than 620,000 Rohingya who have fled violence in Myanmar. One by one, each one of the refugees approached the Pope at the end of the event and through the aid of an interpreter told him their stories and their experiences.